DIE Lunæ, 15 die Octobris. Lady Elizabeth Noel & Bill. Heads for a Conference on the Vote against the Importation of French Commodities. ORDERED, That the Committee for the Bill concerning the Lady Elizabeth Noel (being now sine Dic) shall meet this Afternoon, at Three of the Clock. This Day the Earl of Burlington was introduced, in his Robes, between the Earl of Essex and the Earl of Craven, being likewise in their Robes; the Lord Great Chamberlain of England and Garter Principal King of Arms going before. His Lordship having presented his Patent of Creation upon his Knees to the Lord Chancellor, it was delivered to the Clerk of the Parliament, to be read. The Patent bears Date the 20th Day of March, Anno 17° Regni Serenissimi Domini nostri Caroli Secundi, Dei Gratiâ, Angl. Scotiæ, Franc. et Hib. Regis. Which being done, his Lordship was brought and placed at the lower End of the Earls Bench. The Earl of Anglesey reported, "That the Committee appointed to consider and draw up the Matter for a Conference with the House of Commons, concerning the Vote for prohibiting the Importation of French Manufactures and Commodities, &c. have prepared a Paper to that Purpose, which they offer to the Consideration of the House." "1. Their Lordships foresee, by this Proclamation, a great Abatement in His Majesty's Customs, without any Provision made to supply it otherwise." "2. Their Lordships take Notice of great Damage that will befall his Royal Highness thereby, in his Revenue arising by Wine Licenses, granted this very Parliament." "3. Their Lordships much doubt, that French Wines may still come in, under colour of Rhenish Wines, unless some careful Provision be made to prevent such Abuse." "4. 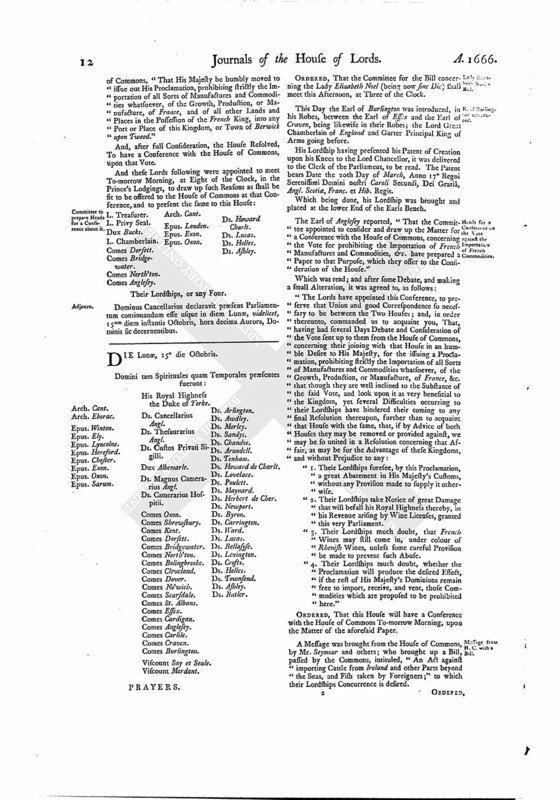 Their Lordships much doubt, whether the Proclamation will produce the desired Effect, if the rest of His Majesty's Dominions remain free to import, receive, and vent, those Commodities which are proposed to be prohibited here." ORDERED, That this House will have a Conference with the House of Commons To-morrow Morning, upon the Matter of the aforesaid Paper. 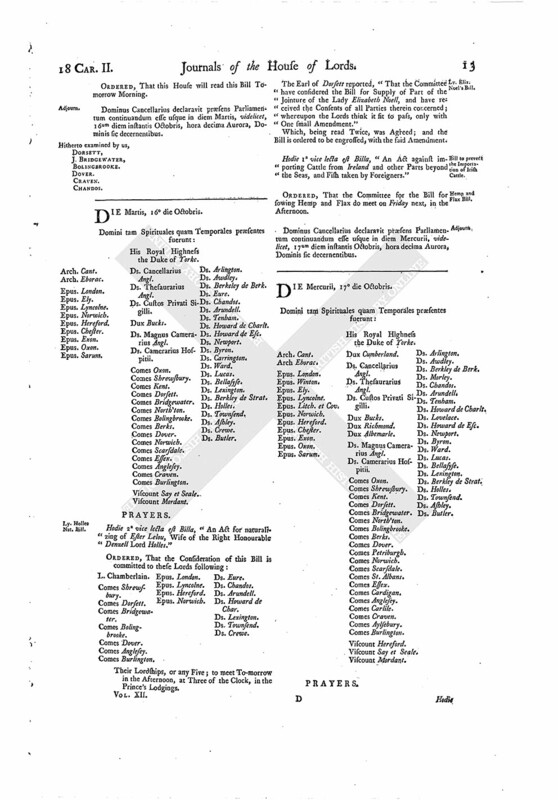 A Message was brought from the House of Commons, by Mr. Seymour and others; who brought up a Bill, passed by the Commons, intituled, "An Act against importing Cattle from Ireland and other Parts beyond the Seas, and Fish taken by Foreigners;" to which their Lordships Concurrence is desired. ORDERED, That this House will read this Bill Tomorrow Morning. Dominus Cancellarius declaravit præsens Parliamentum continuandum esse usque in diem Martis, videlicet, 16um diem instantis Octobris, hora decima Aurora, Dominis sic decernentibus.